DALLAS - They drew his blood, put tubes down his throat and wiped up his diarrhea. They analyzed his urine and wiped saliva from his lips, even after he had lost consciousness. The CDC announced Tuesday that 76 staff members at Texas Health Presbyterian Hospital were involved in the care of Thomas Eric Duncan after he was hospitalized, including a nurse now being treated for the same Ebola virus that killed the Liberian man who was visiting Dallas. On Tuesday, Dr. Tom Frieden, the director of the Centers for Disease Control and Prevention said the infection of the nurse meant the agency had to broaden the pool of people getting close monitoring. Authorities have said they do not know how 26-year-old nurse Nina Pham was infected, but they suspect some kind of breach in the hospital's protocol. Frieden said as a result of the current situation, the CDC was setting up an Ebola response team for hospitals with Ebola patients, and has vowed to put a team on the ground anywhere in the United States "within hours." In a statement released Monday by the hospital, Pham said: "I'm doing well and want to thank everyone for their kind wishes and prayers. I am blessed by the support of family and friends and am blessed to be cared for by the best team of doctors and nurses in the world here at Texas Health Presbyterian Hospital Dallas." The hospital held several town hall meetings for employees Monday amid concerns about the "breach in protocol" that health officials said had lead to Pham becoming infected, CBS Dallas reported. The medical records given to the AP offer clues, both to what happened and who was involved, but the hospital said the CDC does not have them. A CDC spokeswoman said the agency reviewed the medical records with Duncan's care team and concluded that the documents were not helpful in identifying those who interacted directly with the patient. "This is not something we can afford to experiment with. We need to get this right," said Ruth McDermott-Levy, who directs the Center for Global and Public Health in Villanova University's College of Nursing. Medical records provided by Duncan's family indicated Pham, the infected nurse, had daily contact with Duncan. However, many of her coworkers have praised Pham for being fastidious in the use of her protective gear, and with other hygienic measures. Frieden said Tuesday contacts of Duncan have passed through the highest risk period of quarantine and are now unlikely to develop symptoms. "If this one individual was infected - and we don't know how - within the isolation unit, then it is possible that other individuals could have been infected as well," said Dr. Tom Frieden, director of the CDC. "We do not today have a number of such exposed people or potentially exposed health care workers. It's a relatively large number, we think in the end." Caregivers who began treating Duncan after he tested positive for Ebola were following a "self-monitoring regimen" in which they were instructed to take their temperatures regularly and report any symptoms. But they were not considered at high risk. Pham went to the hospital Friday night after she took her temperature and found she had a fever. 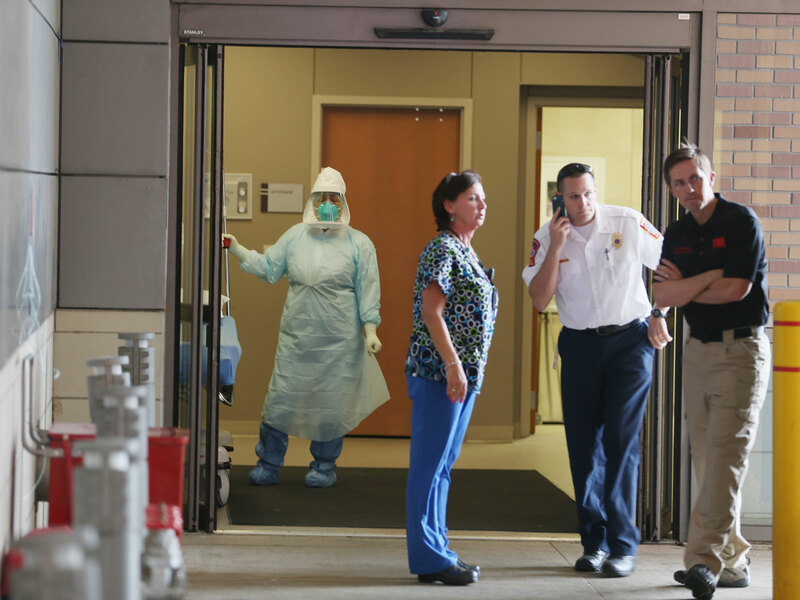 Typically, the nurses, doctors and technicians caring for a contagious patient in isolation would be treating other people as well, and going home to their families after decontaminating themselves. The hospital has refused to answer questions about their specific duties. CDC chief Tom Frieden said Monday that the complication of Pham getting infected means America must "rethink" the way it addresses the disease. Frieden said he is urging all hospitals to "think Ebola" in patients with symptoms and Africa travel. He also promised the CDC would "double down" on training and assistance throughout the country's health care system.